Congratulations, you’ve decided to major in music education! Now buckle your seatbelt. These next four (or five, or six…) years will test you in ways that will challenge you and change you, but if you’re in this for the right reasons you won’t want to be doing anything else. As someone who has been in your shoes, let me give you some advice on how to survive thrive your freshman year as a music major. Surround yourself with the right people. No, not the “right people” meaning some Gatsby-era, socially high-class people. Find the people who make you feel better when you’re around them. These are not always going to be musicians—they can be people you meet in your dorm, waiting in line for Chick-fil-a, through your job, anywhere. Consciously decide to only surround yourself with positive people who motivate you, and who you want to support as well. Misery loves company, and being around those who are miserable and negative will only make you feel the same way. Find a hobby or a passion that is not music. Chances are if you’ve decided to major in music, music has always been your “thing”. It is both wonderful and overwhelming to constantly be surrounded by it, and you will need to find something that is not music to prevent you from viewing your major with disdain. It doesn’t have to be something time consuming like a sports team or a Greek organization—it could be something as simple as reading or more complex, like learning a new skill. For me it was being a Resident Assistant and being outside as much as I could be. You have to have something that is not music in your life, so that you continue to appreciate music as the magic it is. Learn to take criticism. Cliché, but true. You have auditioned into a music program at a university and were probably in an elite musical group at your high school. You’ve had solos, you’ve probably auditioned into county and state-wide ensembles, you may have even lettered in music. I hate to be the bearer of bad news, but none of that matters now. Understand that criticism from your professors is meant to help you improve, and if you cannot accept that then you will stunt your own professional and musical growth. Hard work beats talent when talent doesn’t work hard—don’t make excuses for yourself and always try to be better than you were yesterday. Work smarter, not harder. You were able to remember all your assignments in high school without writing them down? Great! That won’t work now. Use your resources on campus and online to find ways to keep you organized that work for you. I swear up and down by my Google calendar, while one of my friends can’t live without her giant planner color-coded to its limits. Use your first semester to find what works for you so that you can reap the benefits of being organized during the rest of your time at college. Know your limits. College is fantastic because there are so many opportunities that open themselves up to you the moment you set foot on campus. It is important to be involved and be a part of something, but it is not glamorous or admirable to spread yourself wafer-thin. Say yes to new adventures, but say no to opportunities that you are doing to just check off another box on your resume. And of course, know your limits when it comes to other things as well. Do not be afraid to be the responsible one in the room. Get off campus. When I went to school 150 miles away from home, I had no idea how connected I would feel to the area once it was time for me to start a new chapter somewhere else. Go to local businesses, find a community performing group to support, and please go to events and concerts that are not on campus. If you are always in your comfort zone, you are not growing. Your community does not only exist on campus, but in the town and surrounding area, and it is your duty as a college student to support this community and understand why people reminisce about college so much. Be more than book smart. No one cares how good you are at transposing if you don’t know how to do your own laundry. Learn how to cook and clean for yourself, settle into sustainable routines, and always educate yourself about what you could improve on. Take advantage of reduced student discounts to attend networking and professional development opportunities like professional organization conferences and NAfME’s Collegiate Advocacy Summit. Not only do these events make your college experience unique, but you learn so much about what you don’t know and it will only make you a better musician and person as a result. Do not try to be someone you are not. It is very easy to try to assimilate in order to feel like you belong. I’m not telling you to isolate yourself from anyone who is not like you, but do not sacrifice your personal values and traits to gain the favor of others. Treat everyone with professionalism and respect, and learn how to shine in your own way. Even if you are forging your own path, when you take your final bow on your university’s stage you should be proud of the person you have become. Studying music is hard. It is unique in its challenges, but you have chosen this path for a reason. Never lose sight of the reason you made this decision. No matter how challenging things become, or how many ounces of coffee I had chugged to keep me awake, or how many times I heard “That’s wrong, try it again”, I never wanted to do anything else. You have officially taken the first step to the rest of your life—now go practice! 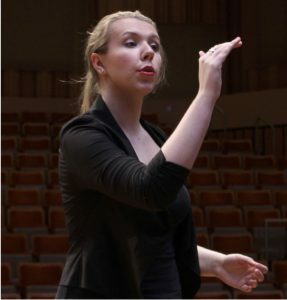 Alexa Bashaw is a recent graduate of Frostburg State University, where she obtained her Bachelor’s in Music Education. While at Frostburg she studied voice, guitar, and choral conducting as well as gaining membership in the President’s Leadership Circle her Senior year. Alexa is enjoying her first year as Choir and Guitar Director at Marley Middle School in Glen Burnie, MD. She is an active advocate for music education and has spent the past two summers advocating with legislators in Washington, D.C. to ensure equal access to music education for all students. In her free time she enjoys travelling, reading, and being outdoors, and is also a member of the Chesapeake Chorale as well as NAfME and ACDA.